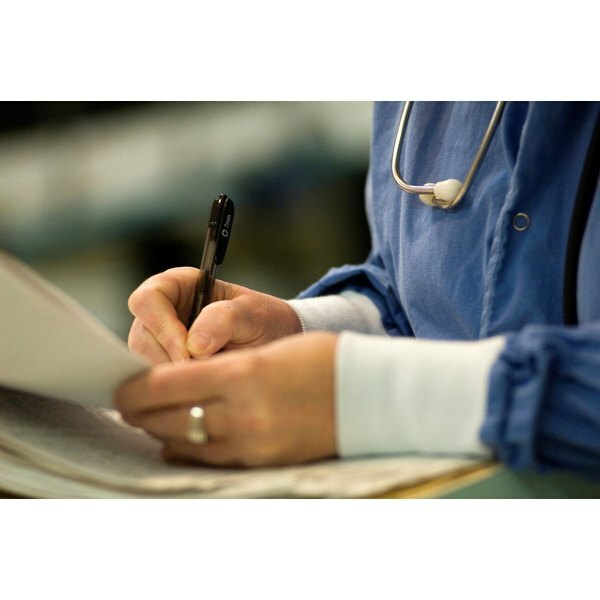 Care plans are an important aspect of the nursing process. Nutritional needs must be addressed to meet a client's gestalt of overall health. Using the nursing process in conjunction with a nursing diagnosis in accordance with the North American Nursing Diagnosis Association, or NANDA, the professional nurse creates an evidenced-based plan of action specific to each individual client or patient. Included in the nursing care plan is an outcome classification as well as an intervention classification. The most effective way to achieve this result is to utilize the nursing process: assess, diagnose, plan, implement and evaluate. Objectively assess the patient's nutritional status. Decide which routes are available for nutritional intake. The most common are intravenous, gastric tube or by mouth. If the patient is able to swallow safely, it is important to know if he is on a specialized diet. Some examples of these would be pureed, liquid, soft, low-sodium, high- or low-fiber and low-caffeine diets. It is then necessary to determine what the optimal nutritional intake would be for this patient at the specific time the care plan is created. Using the nursing diagnosis definitions set forth by the North American Nursing Diagnosis Association, decide which meet the patient's current needs. More than one nursing diagnosis may be required. An example would be: "Nutrition-altered, less than body requirements." Using the nursing diagnosis as a guide, make a detailed plan of care in relation to the patient's current needs. Include monitoring the fluid and food intake and output of the patient throughout the day. Consider weighing the patient daily. If the patient has any food allergies, ensure that these foods are not given. Discover any food preferences the patient may have to increase the potential for completion of meals. Implement the plan of care. Educate the patient on the current goals related to the care plan. Include the patient and other staff on the plan of care so that the entire patient care team is involved and in agreement with the course of action. Document the outcome of the plan, in this case, what percentage of the meal was eaten and if the patient tolerated the nutritional intake without difficulty, such as nausea or vomiting. Evaluate the patient's tolerance of the plan of care. Adjust the plan according to specific needs that are not being met, as well as to any preferences that the patient may have or require. Reassess for any further nursing diagnosis that may be pertinent, including them in the updated plan of care.